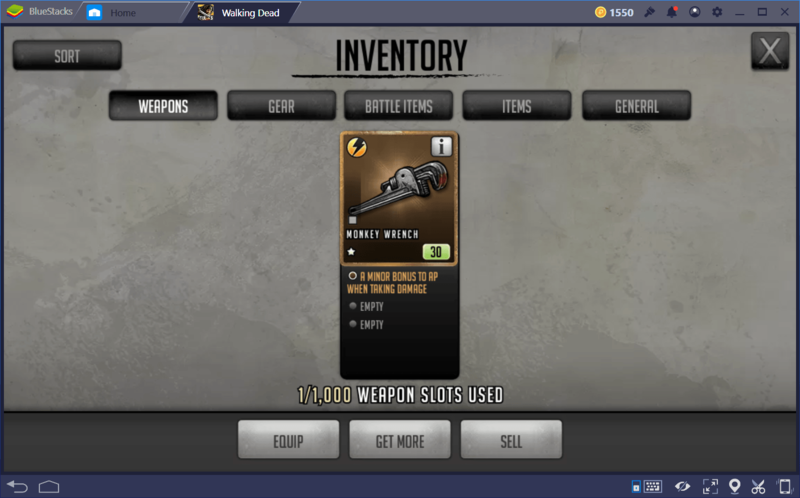 With the success of both the comic and the TV series, it’s no surprise that The Walking Dead would hold a significant presence in the video game industry. The Android market, in particular, is home to a couple of games from this popular franchise, bringing the characters, settings, and some elements of the series to life on your screen. 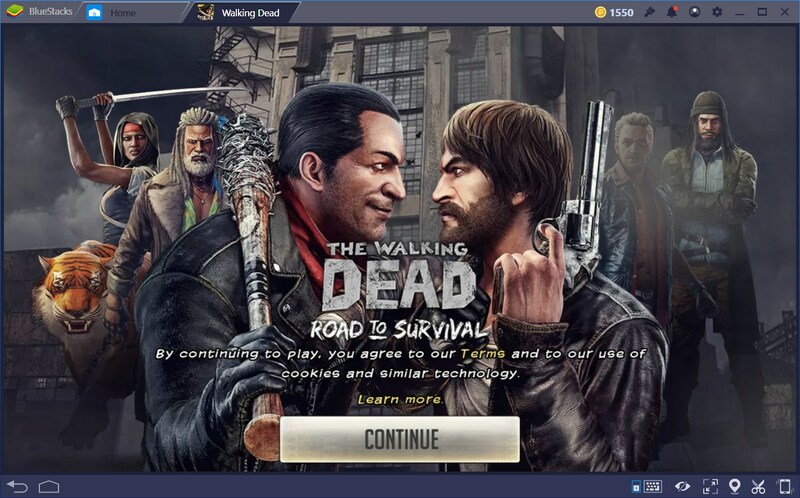 And speaking of screens: did you know that you could be playing The Walking Dead: Road to Survival on your PC, with a bigger screen, and awesome mouse and keyboard control, through BlueStacks, the World’s leading Android gaming platform? If you haven’t checked it out already, feel free to follow this link to find out how you can set up this awesome game on your computer. 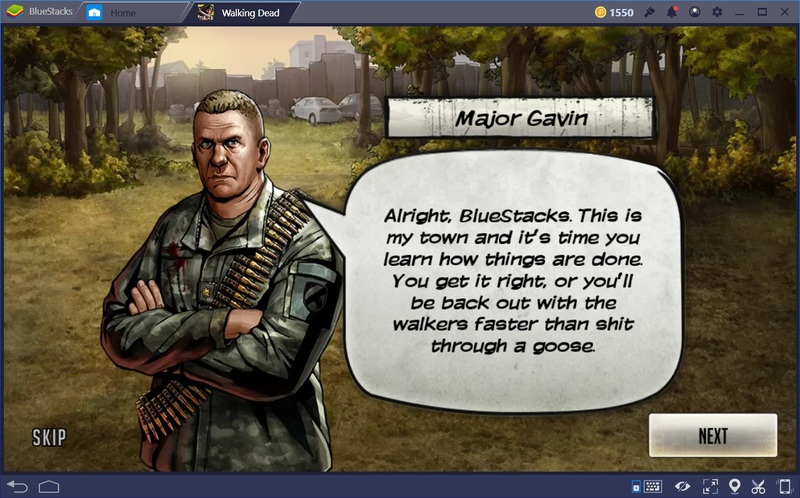 In any case, The Walking Dead: Road to Survival is a popular RPG game in which you, the player, must take control of your home base, construct buildings, and repurpose existing structures to improve your odds of survival in a world that has been swept by a disaster of apocalyptic proportions, and turned most living things into zombies; the walking dead. That being said, the base-building aspect of this game is great, more so than in most games, and the art style that the developers used to represent their characters, buildings, and most elements of the game add to its charm. 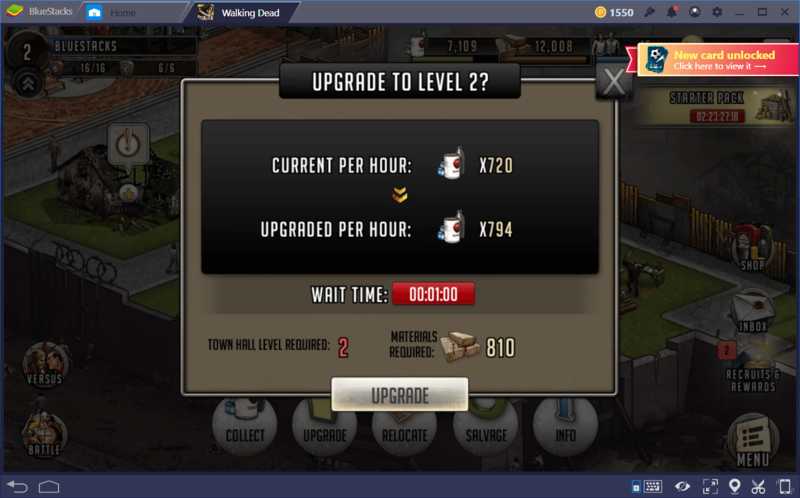 Nevertheless, just like with most games, the base-building element of The Walking Dead: Road to Survival has its own learning curve, which you’ll probably get used to after playing for a while. However, if you’re like us, and want to things right from the very beginning, then you’ll need to know what to expect. In this guide, we will go over most aspects of base building and town management. If you’re interested in learning how to properly develop your base of operations, then read on! If you’re a fan of the series, then you’ll immediately recognize the setting of this game. You’re in Woodbury. Specifically, you’re in Woodbury a few months before The Governor arrives and takes control of the place. It’s your responsibility to take this run-down place, and turn it into a base worthy of respect. In this sense, your town is the main hub in the game. In here, you will be able to gather resources, go on missions, receive mail and correspondence, get in touch with in-game friends, join a guild, manage your inventory, and so much more. 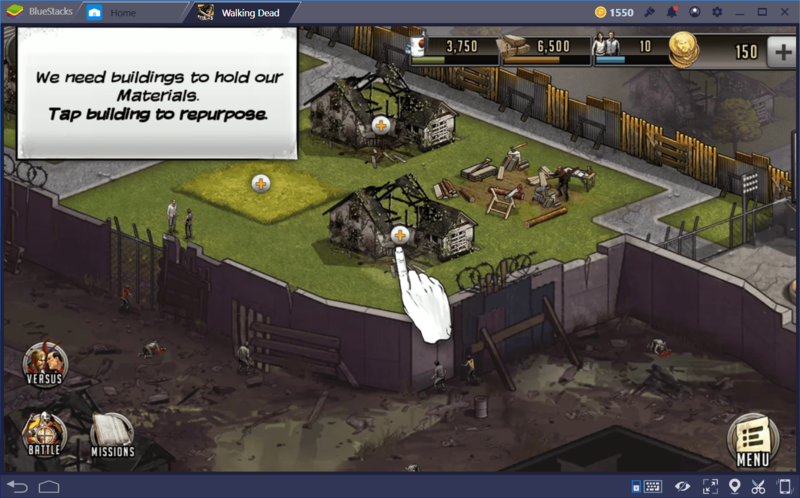 In order to advance through the game’s plot, as well as become able to withstand enemy attacks, you will need to develop your base properly, which means that you’ll need to construct a town that is self-sufficient, able to produce its resources at an acceptable pace, all the while being able to accommodate the survivors that will join your cause along the way. Food: Extremely important for training your characters. When used in conjunction with survivors (another resource), food can be used to obtain new characters to add to your roster. 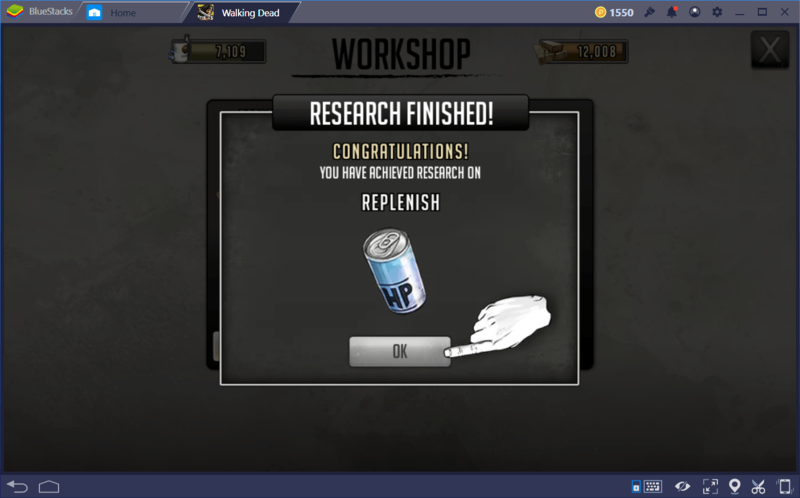 Additionally, food is used in the research of new weapons and combat items in the workshop. Can be obtained by farming in your base, or from combat rewards. Materials: A basic resource used in the construction and upgrading of your town’s buildings and structures. Can be obtained as combat rewards or from material posts. Survivors: Can be used in conjunction with food to obtain new characters. 5 survivors are required for every new character. Keep in mind that some special characters can also be obtained through in-game events. Coins: Coins are the game’s premium currency. They can be used to speed up construction projects and upgrades. While they can be obtained as a combat reward, they can also be purchased using real money. World Energy: Like most mobile games, energy is used when progressing through the game. It regenerates naturally over time. Radios: These can be used to gain access to certain areas of the map for a limited time. Throughout the entire game, you will be juggling these resources back and forth, managing them so that you can progress at a steady pace, without ever running dry. To this end, you will need to keep your production buildings running and upgraded to their highest possible levels at all times. However, before we get into buildings and structures, we need to explain other objects that, while not technically resources, are also very important in order to overcome the many challenges that this game throws at you. We’re talking about your inventory and all that is contained within. Weapons: As their name implies, these are what your characters use to dispatch the living dead, as well as enemy raiders. From this menu, you can sell, equip, or buy new weapons. Gear: Unlike weapons, gear can’t be equipped. However, they are used for the leveling and upgrading of your characters. Battle Items: These items can be used in battle. Ingredients: Used for the crafting of battle items in the workshop. General: In this section, you will only find radios and world energy refills, as well as a button that will let you purchase more of these with, you guessed it, real money. Town Hall: Arguably the most important building in the game. Your Town Hall will determine how much you can upgrade any other structure. Furthermore, by upgrading this building, you will also increase the number of similar structures you can have at any given time, as well as obtain access to new buildings. Farm: As their name implies, these structures will be the main source of food throughout the game. They can be upgraded to increase their production per hour. Material Post: These structures repurpose scraps into materials used for the construction of other buildings. In other words, they generate materials for you to use on your base. Increasing the level of the Material Post will increase your production of materials per hour. 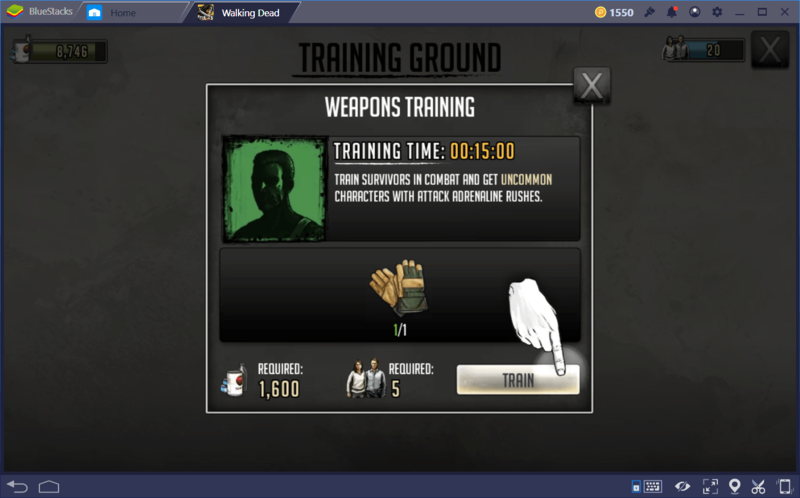 Training Ground: Used in the training of survivors into new characters that you can add to your roster. You can create characters with different specializations here. As you level up the Training Ground, you will gain access to new types of characters. Workshop: In this building, you’ll be performing all your crafting of battle items, which can be used in combat to achieve a wide variety of effects. House: Gives shelter to the survivors that will eventually become new characters to add to your roster. Food Storage: Can be used to store excess food produced by your farms. If you reach maximum capacity, production stops, which is bad. Always keep your farms and storage buildings at their highest possible levels. Material Storage: Same as food storage, but with materials, instead. That’s all there is to base-building in The Walking Dead: Road to Survival. Luckily, the developers didn’t want to get cheeky by adding all sorts of confusing mechanics and, instead, opted to focus on engaging combat scenarios and a story-driven game. In this sense, this game excels at its purpose, while also giving players something to work towards by allowing them to build and upgrade their town in a straightforward manner.